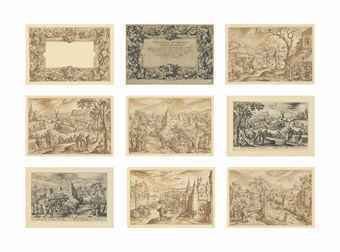 The 13 drawings and the 13 prints for which they served as designs are mounted in an album. The album, which was last recorded in a 1819 sale catalogue, recently emerged when a collection of books from a family of bibliophiles was offered for sale at Christie’s in London. The book contains the complete and previously unpublished set of preparatory drawings for the Emblemata Evangelica: a series of prints designed by Hans Bol, engraved by Adriaen Collaert and published by Johannes Sadeler (1550-1600). The rediscovery of this remarkable and intact series is of great significance for the understanding of Bol’s working methods as a draughtsman and print designer and forms an important addition to his oeuvre. The drawings will be published in Stefaan Hautekeete’s forthcoming New Hollstein volume on the prints of Hans Bol. The album once formed part of the celebrated library of the Marquess of Blandford at White Knights. In the 1819 sale catalogue it is described as containing “remarkably fine impressions of the plates, by Sadeler, together with the beautiful original drawings by Hans Bol. Inlaid on fine drawing paper, and splendidly bound in red morocco”. Complete series of print designs by Bol are extremely rare and, in the present case, the album includes not only the drawings for the twelve months in the series, but also the design for the frontispiece and an impression of each of the related prints, mounted opposite its preparatory study. The Museum Boijmans Van Beuningen in Rotterdam also has a complete, or rather nearly complete series of designs by Hans Bol, twelve roundels depicting the months, though lacking the design of the title plate. The album was sold at Christie’s on 16 July 2014 (lot 69) and realized 426.850 euro (incl. premium). The buyer is ‘a European Foundation’. The series of drawings will be included in the forthcoming New Hollstein volume on the prints of Hans Bol by Stefaan Hautekeete. See more on Christie’s website.